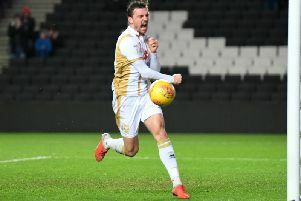 MK Dons fans will be hoping for the Manager of the Month curse to strike after Tranmere Rovers boss Micky Mellon picked up the prize for March. Dons play Tranmere tomorrow (Saturday), with Mellon winning the gong having led his side to four wins and a draw last month, with an 11-1 goal-difference. The Rovers boss beat Tisdale, Lincoln manager Danny Cowley and Port Vale chief John Askey to the League 2 award, while Forest Green Rovers midfielder Reese Brown was named League 2 Player of the Month. Tisdale said: "They've had a fantastic two months, a really incredible run of performances and results. He deserves it. It's nice to be nominated, shows we're in a good run of form. But it's really about the game on Saturday, but well done to Micky and his team- they've done really well." MK Dons and Tranmere Rovers are no strangers to vital matches against each other down the years. In one of Dons’ most infamous matches back in 2005, a Gareth Edds winner in the 84th minute ensured all three points against Rovers, while managing to avoid relegation to League 2 on the final day of the season. The teams were regular opponents between 2004 and 2014, with Dons picking up 10 wins and Tranmere five, and just a single draw in 16 meetings. However, with Rovers’ descent into the National League, the sides had not met prior to this season since February 2014, playing out a 1-1 draw at Stadium MK last September. Following their promotion last season, Micky Mellon’s side have taken to life very well in League 2, and are still in with a chance of snagging one of the automatic promotion spots, with just one defeat in their last 11. They will begin the day in fifth place, four points adrift of Dons in second.